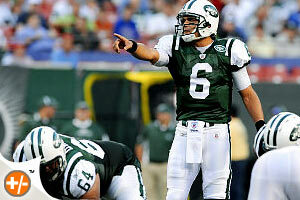 NFL 2010 Predictions -Will Mark Sanchez lead the Jets to victory? Talk about pressure: Only his second year in the NFL for the Pro QB and he has all the big contenders depending on his offensive play making to take them to the Super Bowl. Recent knee surgery has put Sanchez in the passenger’s seat during winter training but it appears that proper precautions have been taken to guarantee a solid return for the 2010 NFL betting season. Sanchez’s talent for throwing with powerful accuracy along with his athletic ability will prove him to be a hard to sack QB. He has “pocket presence” and knows where he’s most comfortable. Even though he is a bit smaller than most QB’s, he has no fear of the big guys coming his way and avoids them with agility and speed on his feet. Sanchez has a lot on his shoulders but he has a successful defensive team with a long running history and a great offense. Santonio Holmes will be coming in as Sanchez’s new receiver after he finishes his 4 game suspension for violating substance abuse policies. Darrelle Revis to negotiate disputes, just doesn’t show up to training camp. I’d like to see any one of us want a raise and negotiate it by not showing up for work. I sure hope Rex Ryan knows what he’s doing there. But let’s not look at the negative and look at what Sanchez does have to work with. Santonio Holmes: this wide receiver can catch a ball from anywhere, his foot action and route running is out of this world. Darrelle Revis: is a phenomenal Cornerback. His three year streak in the NFL has been insane. Revis is known for sticking to receivers like glue. Keep in mind that the jets were the first team since 2006 to stop the Patriots from a touchdown. Revis is one player you don’t want missing from the field. Let’s just hope that contract disputes end soon. Antonio Cormartie: a 109 yard return, longest play in the NFL history and his history shows there’s no stopping him either. Will Mark Sanchez lead the Jets to a NFL predictions victory in 2010? I’d wish him good luck but, no need for that when the NFL 2010 predictions clearly show the odds are on his side.